Trucking companies have had a tough time hiring drivers willing to hit the road for long hauls. Now the U.S. is speeding toward a critical shortage of truck drivers in the next few years and companies are upping pay, making the job easier, and opening it up to new kinds of drivers. It's never been harder to hire long-haul truck drivers, even though companies are making the job more lucrative, less aggravating and more inclusive. The driver shortage stretches back a quarter century, and lately a run-up in freight demand, staggeringly high turnover rates and waves of baby boomer retirements are compounding the problem. The American Trucking Associations figures companies need about 60,000 drivers, a number that could top 100,000 in just a few years. Trucks move almost all of the food and other items Americans purchase, and the shortage of drivers is driving up shipping rates. "It's not like these folks are making horseshoes," says Todd Spencer, president of the Owner-Operator Independent Drivers Association. "Trucking is an absolutely essential, critical industry to the nation, to everybody in it," Spencer says. Trucking companies are responding in three basic ways: recruiting drivers who don't fit old trucker stereotypes, making the job easier and raising pay. 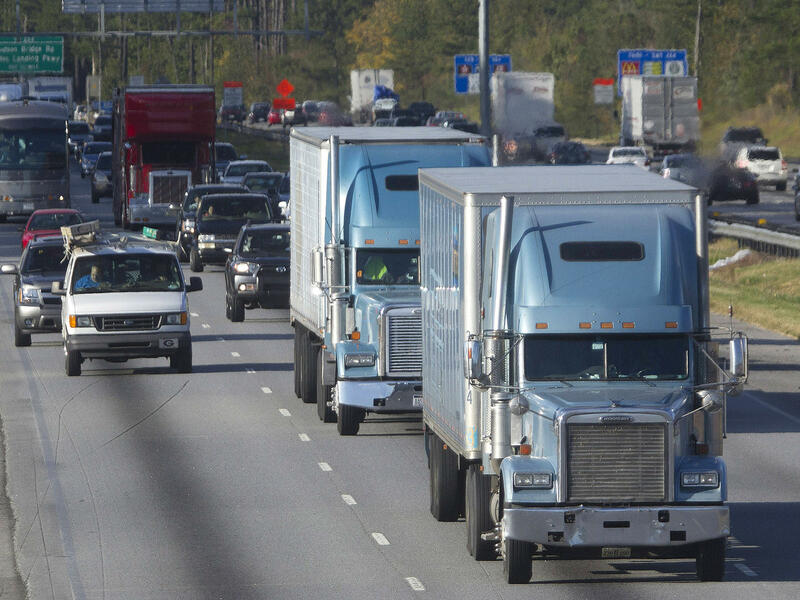 "It's certainly a natural market reaction whenever there's a shortage — pay goes up, and we've seen that," says Bob Costello, chief economist for the American Trucking Associations. Costello says trucking companies boosted pay sharply last year. Gordon Klemp, president of the National Transportation Institute, figures that increase was close to 10 percent on average, which would make average driver salaries crest at $60,000 by his estimates. And Costello says truckers are demanding more than good pay. 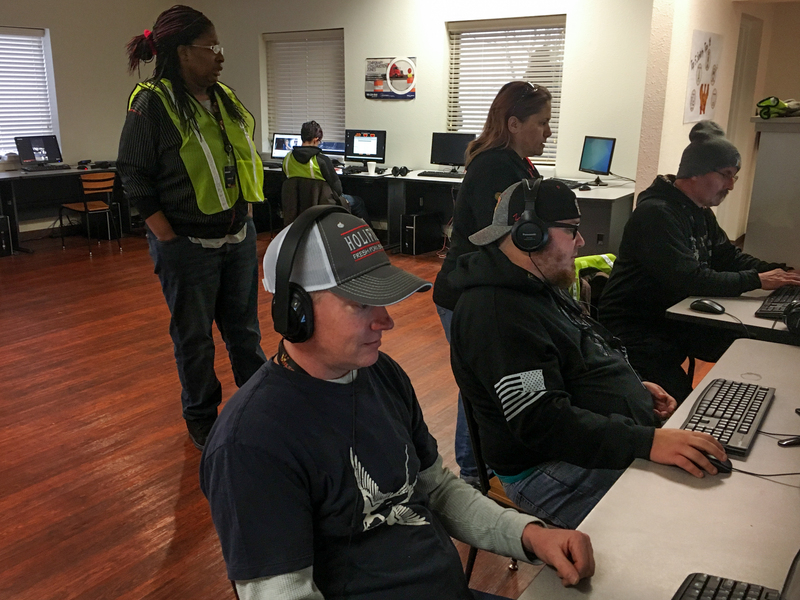 Truck driving trainees work in the classroom at Wilson Logistics driving school in Springfield, Mo. Despite pay hikes and greater inclusivity, there is still a critical shortage of long-haul truck drivers. "If you're not getting a 401(k), health care, paid time off, you need to get a different job, because you can get all of that," says Costello. Some trucking companies sweeten the deal with bonuses for signing on, referring people, or just staying with a company. Some have begun offering free, online college tuition for drivers. But even with the recent pay hikes, Klemp says drivers make less now than they did in the 1980s, adjusted for inflation. The way truckers can be treated by shipping companies is another huge issue. Most long-haul truckers are paid by the mile, not by the hour. And some routinely spend hours waiting to load or unload at shipping facilities. That wait time cuts straight into drivers' income. Thomas J. O'Conner, president of YRC Freight, says his company and others are taking a harder line with shipping customers who tie up their drivers. "If you're tying up my driver or my equipment, then it's going to be harder for me to justify dedicated equipment to your business needs or charging what I charge you today," says O'Connor. "It's going to cost you more." But O'Connor admits that improving pay and alleviating headaches won't solve the driver shortage. "I think as an industry we need to be more creative and resourceful to attract and retain top-notch people, O'Connor says. And there's one huge group of people in particular the industry needs to attract: women. Currently about 8 percent of long-haul drivers are female. "So, that's clearly an opportunity for us," O'Connor says. The trucking industry's efforts to increase that percentage seem to be working. "More women are coming into the fold, [a] more diverse population," says Angela Thornton, an African-American woman who's training for a driving job with the trucking company Wilson Logistics. "It's starting to become more flexible, and more welcoming." But Thornton, whose father is a trucker, says that while companies may be more welcoming of women, minority and LGBT drivers, aspects of the trucking industry are not. 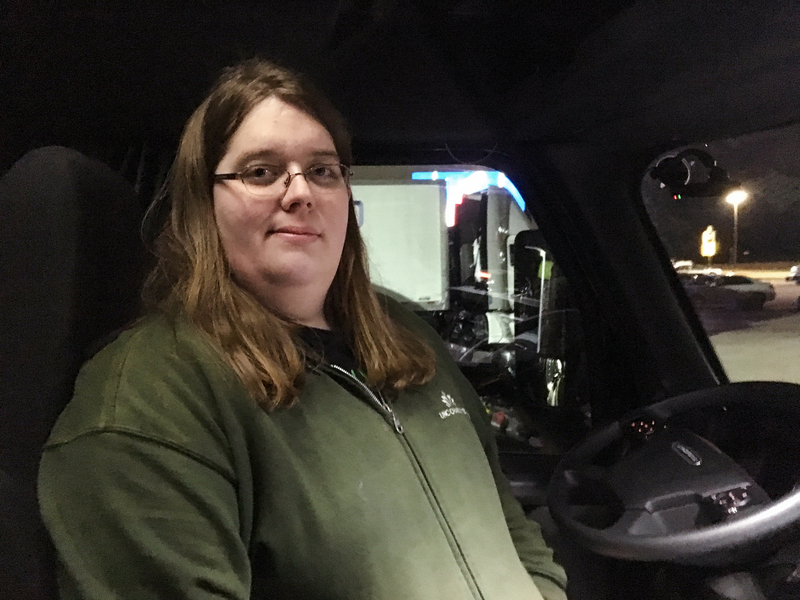 Ellie O'Daire, a transgender driver, at a Sapp Bros. truck stop in Percival, Iowa. The industry has become more inclusive as it seeks to alleviate a critical shortage of drivers. Long-haul truck drivers work and live in their trucks. There aren't many places to park a semi, so drivers are tied to truck stops for food and truck bathrooms, night after night. "[There are] safety concerns, especially if you're a solo female driver," Thornton says. This is the kind of thing trucking companies hate to hear, given the importance they place on recruiting women. But companies have an advocate in Ellen Voie, president and CEO of Women in Trucking. "We work with the truck stops on lighting and fencing and reporting to them a truck stop that's not safe," Voie says. Voie estimates the percentage of women who are long-haul drivers has doubled in the past dozen years, and she expects it to take off sharply in the near future. "I got into [truck driving] in the most millennial way possible. I was playing too many video games," O'Daire says. 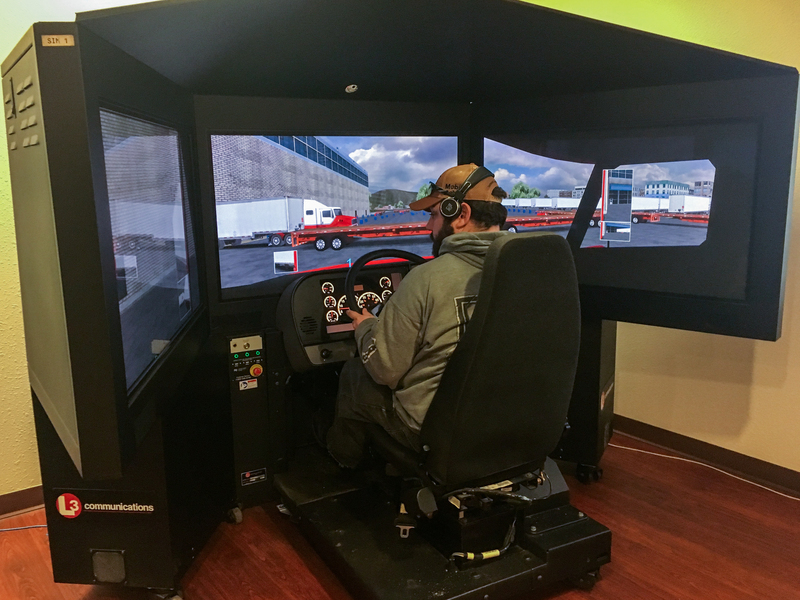 O'Daire says a game that simulated truck driving sparked questions about the real life industry. It wasn't long before she encountered a Wilson Logistics employee online, who ushered her into a trucking company founded and run by Darrel Wilson. John Bounds sits behind the wheel of a driving simulator. Wilson says the job has changed dramatically since he started driving with his father in the 1970s. Many new trucks have automatic transmissions and the type of safety features you might expect on a new car: cameras and computers that watch lanes, look out for obstacles and even hit the brakes automatically sometimes. Modern technology also allows companies to track drivers meticulously, which annoys some veteran truckers. "If someone likes it, they can almost make it into a big video game for themselves, and I think Ellie does a pretty good job of that," says Wilson at his desk in Springfield, Mo. "She buys into our safety technology, doesn't buck it. So, yes I think as technology changes, the folks it appeals to change and our face changes." There's no doubt the face of trucking is changing, it's just not clear that's happening fast enough to reverse the deepening shortage of truck drivers. Most of the stuff around us right now - I don't know - the television screens and microphones in the studio, products in your house, parts of every car, parts of almost every building, were once transported by truck. And the system that moves all that freight has a fundamental problem. There are not enough drivers. Trucking companies say an acute shortage is causing delays and driving up consumer prices. Frank Morris of our member station KCUR has the first of two stories. FRANK MORRIS, BYLINE: On a parking lot in Springfield, Mo., marked with orange traffic cones, John Bounds is changing career lanes, learning to drive a semi truck. A mouse click at home in Georgia landed Bounds behind the wheel of this big rig. JOHN BOUNDS: I clicked on Wil-Tran (ph). And it wasn't a couple days later they called me back, got in touch with me, you know, made it really easy for me to choose this company. MORRIS: Wil-Trans courted Bounds, 43-year-old meat cutter with zero trucking experience, like a star athlete for a job that starts above $40,000 a year because as fellow students like Jessy Dager, 21-year-old in Philadelphia, know, this industry is desperate for drivers. JESSY DAGER: I like this company a lot, so I'm not going to say I'm not going to be here. But if I wanted to go somewhere else, there's a plethora of places I could go and get a job almost anywhere in the country. MORRIS: The trucking industry's been short of drivers for decades, but the problem keeps getting worse. A big run-up in shipping demand, baby boomer retirements and a staggering turnover rate have left trucking companies unable to fill some 60,000 jobs. T.J. O'Connor, president of YRC Freight, says that's forcing them to turn down lucrative business. TJ O'CONNOR: Well, I think as an industry, we need to be more creative and resourceful to attract and retain top-notch people that are very safety-focused, that have an interest and understand what they're getting into. MORRIS: Of course, money is part of the solution. Some companies are offering signing bonuses, referral bonuses, longevity bonuses, paid time off, retirement plans and health care. Last year, average trucker income spiked to around $60,000. LORI FURNELL: Pay has gone up tremendously. And in some cases, you know, you're talking 10, 11 percent. MORRIS: Lori Furnell is director of talent acquisition for Walmart's huge trucking fleet. They've got 900 openings. FURNELL: Our first-year drivers with Walmart will average about 87.5 this year. MORRIS: Eighty-seven thousand, five hundred dollars with good benefits. And like some other trucking firms, Walmart's also offering drivers nearly free online college tuition. But Walmart only hires experienced drivers with sterling safety records. Todd Spencer, president of the Owner-Operator Independent Drivers Association, says average driver income slumped for decades before last year's boost. TODD SPENCER: The only real shortage is - it's a pay shortage (laughter), so that's the shortage. Even the crappiest job will attract workers and keep them if they pay enough. MORRIS: Most long-haul truckers don't get a salary or even an hourly wage. They get paid by the mile. It's been that way since the 1930s, partly as an incentive for drivers hauling unrefrigerated food to move it as fast as possible. Drivers liked it. They made more that way. Now the government enforces strict limits on the amount of time drivers can spend behind the wheel. Many face long delays in traffic and hold-ups loading and unloading that can eat up much of their driving time, all without pay. SPENCER: You put in a whole lot of hours for the money you get. MORRIS: The driver shortage in tight freight markets are making it more expensive for shippers to waste drivers' time. Companies are trying to structure routes to give drivers more predictable pay and schedules. But all that isn't enough to fix the driver shortage. And companies are working hard to broaden the appeal of trucking. For NPR News, I'm Frank Morris in Kansas City. (SOUNDBITE OF ...OF SINKING SHIPS' "IT NEVER MATTERED TO YOU") Transcript provided by NPR, Copyright NPR.